On the west side of Hawaii's big island stretches the beautiful and sunny District of Kona. Unlike what we expected to see on this tropical island, most of Kona is covered in a volcanic landscape. We were initially blown away as we drove along the coast through the lava fields, feeling as if we were on another planet. That was until we stopped at a gorgeous beach hidden between the rocks with pearly white sand and turquoise blue waters. These striking changes in scenery left us in awe and wanting to see more. The main hub of the area is the little town of Kailua in the southern part of the district. Here you can find that jungle vibe you are looking for with palm trees and tropical flowers everywhere. We spent a week staying with friends at their condo near Keauhou Bay and have created a list of our favorite things to do, eat, and drink in Kona. Kona has many beautiful beaches to choose from along the coast. We went to a different beach everyday. There is nothing better than packing up a bag with your beach gear, a few beers and lounging in the Hawaiian sun all day only to be inturupted by a swim in the crystal blue waters. Mauna Kea Beach Hotel - You don't need to be staying at this luxurious hotel to enjoy their beautiful beach. This iconic crescent shaped beach is one of the prettiest white sand beaches on the island. There is a public beach with a small parking lot available for anyone, just make sure and show up early to get a parking spot. Magic Sands - If you are looking to play in some gnarly big waves, this is the spot! A beautiful little beach with a sandy break. Manini'owali Beach (Kua Bay) - Perfectly turquoise water and pearly white sand. Bring your snorkel gear and explore the coral off shore and jump from the rocks jetting out of the ocean. TIP: When visiting Mauna Kea Beach make sure to walk down along the beach until you find this tiny beach bar (pictured above) for a frozen tropical cocktail. This historic bay is 12 miles south of Kona and is a marine life conservation area which is why it is a popular destination for snorkeling, kayaking and scuba diving. Being accessible only by boat or a strenuous hike; this bay is pristine and hosts an abundance of underwater life. It is also the location where the first European explorer first discovered Hawaii, Captain Cook. There is a monument on shore marking the exact spot they landed. Check out the photo below for an aeriel shot of this remarkable bay. TIP: We booked our snorkel excursion to Kealakekua Bay onboard the Hula Kai, part of the Fairwind Cruises fleet. This was one of the best experiences of our trip. Not only was the boat beautiful, the crew on board was super friendly. You start your day with breakfast while anchored in a beautiful cove where you can snorkel around the reef below. After breakfast we headed off to Kealakekua Bay where we stayed most of the afternoon. While we were splashing around and in this underwater paradise filled with colorful fish, the crew cooked up a delicious BBQ lunch of cheeseburger and chicken which was waiting for us when we boarded the ship again. Oh, and did we mention there is also a bar on board! Click HERE to book a unforgettable day aboard the Hula Kai. The most exciting day of our whole trip! We decided to surprise Jeff on his birthday by chartering a boat to take us deep sea fishing. We didn't quite know what to expect and ended up having one of the best days ever! After cruising around for an hour or so with nothing as much as a nibble we finally discovered a school of Mahi Mahi! What luck! We all ended up roping a couple of these giant colorful fish and before we knew it we had caught 10! It was so thrilling and by the end our arms were tired from fighting these fish one after another. We were all on cloud nine as we slowly started to make our way back to shore when a marlin hit one of the rods still in the water. As the line quickly unraveled we saw this 150 lb animal jump out of the water. (Check out the video below.) Jeff hopped into the chair and after fighting this massive fish for 15 minutes he finally reeled it in. Wow! After we returned to the dock the captain masterfully filleted two Mahi Mahi for us which we took home and got to eat. That night we made fresh Mahi Mahi ceviche and also crusted some fillets in macadamia nuts, so delicious. Talk about fresh! Look at those smiles! One of the best experiences we had during our trip to Kona! TIP: We booked our deep sea fishing excursion with the Captain Jack also part of the Fairwind Cruises fleet. If you book a snorkel tip on the Hula Kai you get a discount for booking fishing on the Captain Jack. Both were incredible. Click HERE to head to their website. The big island is one of the rare places in the world where you can still see an active volcano's lava flow directly into the ocean. This is a once in a lifetime experience, hire a boat or take a helicopter to see one of the worlds most facinating natural wonders. One of the biggest resorts on the island is the Waikoloa Village. Complete with a multiple pools with cascading waterfalls, hot tubs, a subway system, dolphin sanctuary, shopping center, and a man made lagoon this property is unreal. Although we didn't stay here we went for the day, swam in the pools and drank frozen daiquiris from the pool bars. With multiple restaurants and bars speckled throughout this huge resort you will find something for everyone here fore everyone. The best time of day in Hawaii is most definitely happy hour. Nothing beats cheap drinks with your feet in the sand. We've complied a list of our favorite bars below. Pick one, grab a Mai Tais from the bartender and post up to watch the sun fall behind the blue ocean as the sky puts on a show. Our favorite place in Kona! Umeke's is fresh, local and has some of the best Hawaiian food on the island. With fresh fish coming in daily from fisherman you can't go wrong with any of their signature poke and fish dishes. But the real star of the show here is their fish tacos, fried or grilled these tacos will keep you coming back day after day. This award winning hole-in-the-wall poke shack is unlike any place you've ever been. Here poke is the name of the game and it's the best on the island. With a variety of different fish and sauces you get to create your own poke bowl! The mixed ingredients can vary from seaweed, onions, soy sauce, avocado aioli, peppers, seasame seeds and everything in between. Add a couple scoops of rice and enjoy one of the best poke bowls you will ever have! Our bowl! With 4 different scoops of ahi poke, seaweed salad and spicy clams. This colorful and local go-to spot is perfect for a night out. Their seafood specials and pupu platters are top notch. The Seared Wasabi Ahi dish (pictured below) was one of the best dished we had during our trip to Hawaii. Their cocktail and wine menu is impressive as well. 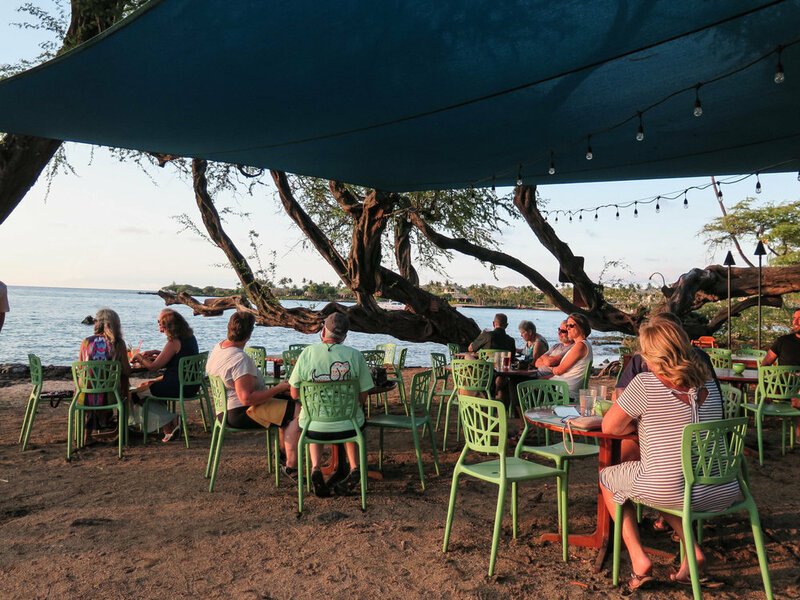 Situated on the palm tree lined ocean front of old town Kona, the Kona Inn has an amazing restaurant and bar. It is carefully designed with wooden chairs and a Hawaiian flare. And here like many restaurant in town seafood is king with the catch of the day coming in daily from local fisherman. Our suggestion: Order the Macadamia Nut Crusted Mahi Mahi and don't forget the Mac Nut Pie for dessert with a scoop of macadamia nut ice cream. A dining experience like no other. This restaurant inside the Sheraton hotel is situated on the lava rocks next to the water that overlooks Keauhou Bay. 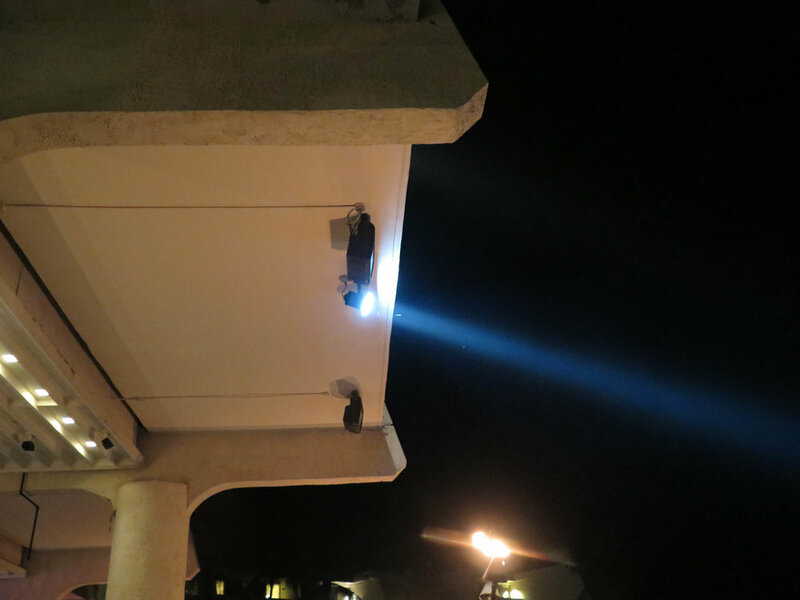 As the sun goes down and the stars come out so do the resident Manta Rays who spend the evening feeding right offshore literally feet away from your table. Once it gets dark the restaurant turns on these giant lights that shine into the water illuminating these gentle gliding giants. With great food, drinks, and the chance to see these magnificent creatures in their natural habitat Ray's on the Bay is wildly unique and should not be missed! TIP: We highly suggest making a reservation if planning to dine at Rays on the Bay. Ask for a table near the water or you can skip dinner, grab a drink at the bar and stand near the railing to watch the manta rays swim by. Boasting to have one best Mai Tai's on the island the Kona Inn is a world-famous watering hole. The beautiful horseshoe-shaped all-Koa-wood bar is the perfect place to come for happy hour. With $5 Mai Tais from 2:00-5:00 this place is hard to beat. Located inside the Waikoloa Village the Lava Lava Beach Club is the perfect place to come after spending the day exploring the resort. With live music, you can dance with your feet in the sand and while enjoying unbeatable sunset views. 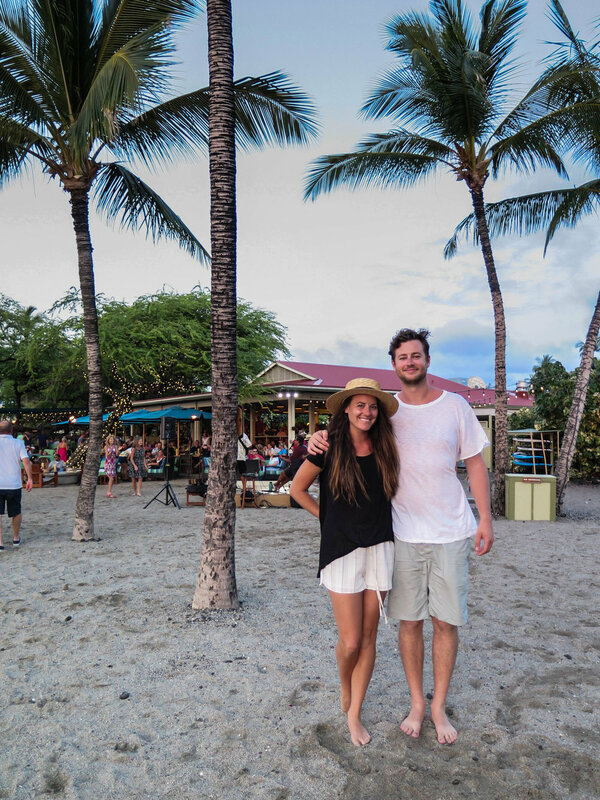 We loved laid back vibe and drinks at Lava Lava. 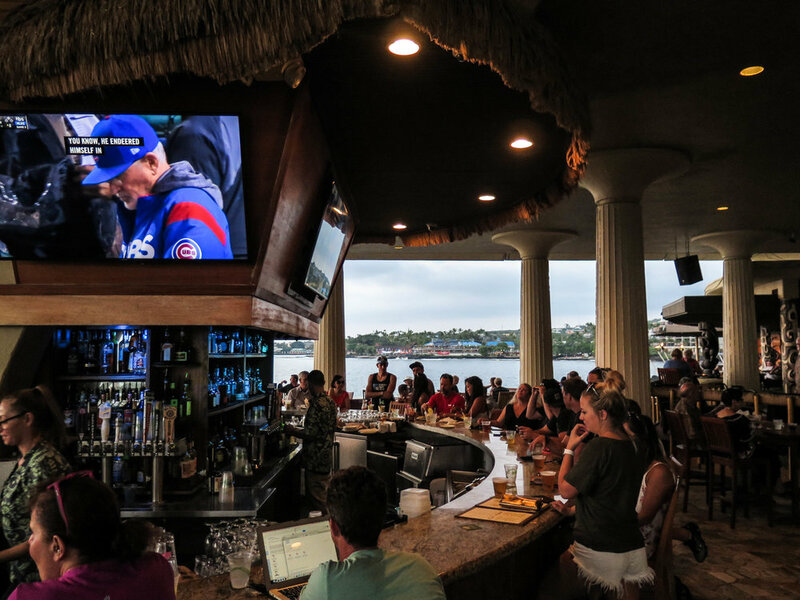 This wonderful tiki style sports bar hosts 180° views of the Pacific Ocean and Kailua Bay. With 10 differnent Mai Tais on the menu it may be hard to choose just one. Thankfully they offer a Tiki Tasting flight where you can try 4 of their legendary cocktails. Getting tired of Mai Tais? This place has 5 different Mojitos on the menu as well, we suggest the Ginger Peach. 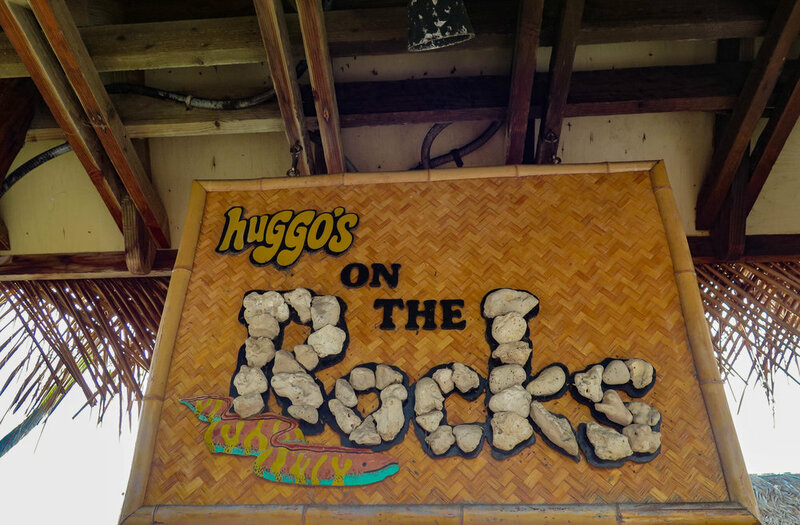 Adjacent to Huggos, On the Rocks is an ideal "toes in the sand" beach bar. With live music on the weekends and an array of tropical libations this spot is a lot of fun. The happy hour is from 3:00-5:00 where you can get $5 Mai Tais and $2.50 local beers. Grab a spot near the water, relax and enjoy. TIP: No trip to Hawaii would be complete without trying some of Kona Brewing Co.'s famous beers. They can be found at all the grocery stores in town and in most of the bars and restaurants as well. You can also visit the original microbrewery and restaruant at 74-5612 Pawai Pl, Kailua-Kona, HI 96740. Try Ang's favorite beer - the Wailua Wheat. We hope you enjoyed our list of our favorite things in Kona. If you end up at one of these spots make sure to drink a Mai Tai for us!